by Chris Woodford. Last updated: December 25, 2018. Thank goodness for computer networks! If they'd never been invented, you wouldn't be reading this now (using the Internet) and I wouldn't be writing it either (using a wireless home network to link up my computer equipment). There's no doubt that computer networking is extremely complex when you delve into it deeply, but the basic concept of linking up computers so they can talk to one another is pretty simple. Let's take a closer look at how it works! 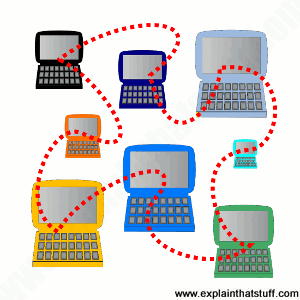 Artwork: The basic concept of a computer network: a collection of computers (and related equipment) hooked up with wired or wireless links so any machine can exchange information with any other. Photo: Testing a small computer network linked to the Internet. Photo courtesy of NASA Glenn Research Center (NASA-GRC). You can do lots of things with a computer but, connect it up to other computers and peripherals (the general name given to add-on bits of computer equipment such as modems, inkjet and laser printers, and scanners) and you can do an awful lot more. A computer network is simply a collection of computer equipment that's connected with wires, optical fibers, or wireless links so the various separate devices (known as nodes) can "talk" to one another and swap data (computerized information). Photo: A wireless router like this one, made by Netgear, is the heart of many home PANs. Not all computer networks are the same. The network I'm using to link this laptop to my wireless router, printer, and other equipment is the smallest imaginable. It's an example of what's sometimes called a PAN (personal area network)—essentially a convenient, one-person network. If you work in an office, you probably use a LAN (local area network), which is typically a few separate computers linked to one or two printers, a scanner, and maybe a single, shared connection to the Internet. Networks can be much bigger than this. At the opposite end of the scale, we talk about MANs (metropolitan area networks), which cover a whole town or city, and WANs (wide area networks), which can cover any geographical area. The Internet is a WAN that covers the entire world but, in practice, it's a network of networks as well as individual computers: many of the machines linked to the Net connect up through LANs operated by schools and businesses. Artwork: The three best-known computer network topologies: line (chain/bus), ring, and star. Computers are all about logic—and logic is all about following rules. Computer networks are a bit like the army: everything in a network has to be arranged with almost military precision and it has to behave according to very clearly defined rules. In a LAN, for example, you can't connect things together any old how: all the nodes (computers and other devices) in the network have to be connected in an orderly pattern known as the network topology. You can connect nodes in a simple line (also called a daisy chain or bus), with each connected to the next in line. You can connect them in a star shape with the various machines radiating out from a central controller known as the network server. Or you can link them into a loop (generally known as a ring). All the devices on a network also have to follow clearly defined rules (called protocols) when they communicate to ensure they understand one another—for example, so they don't all try to send messages at exactly the same time, which causes confusion. Just because a machine is on a network, it doesn't automatically follow that every other machine and device has access to it (or can be accessed by it). The Internet is an obvious example. If you're online, you get access to billions of Web pages, which are simply files stored on other machines (servers) dotted all over the network. But you can't access every single file on every single computer hooked up to the Internet: you can't read my personal files and I can't read yours, unless we specifically choose for that to happen. Permissions and security are central to the idea of networking: you can access files and share resources only if someone gives you permission to do so. Most personal computers that connect to the Internet allow outgoing connections (so you can, theoretically, link to any other computer), but block most incoming connections or prohibit them completely. 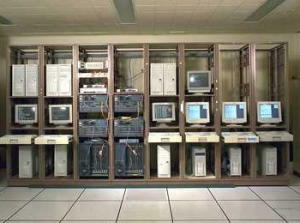 Servers (the machines on the Internet that hold and serve up Web pages and other files) operate a more relaxed policy to incoming connections. You've probably heard of hacking, which, in one sense of the word, means gaining unauthorized access to a computer network by cracking passwords or defeating other security checks. To make a network more secure, you can add a firewall (either a physical device or a piece of software running on your machine, or both) at the point where your network joints onto another network or the Internet to monitor and prohibit any unauthorized, incoming access attempts. To make a network, you need nodes and connections (sometimes called links) between them. Linking up the nodes means making some sort of a temporary or permanent connection between them. In the last decade or so, wireless connections have become one of the most popular ways of doing this, especially in homes. In offices, wired connections are still more commonplace—not least because they are generally faster and more secure and because many newer offices have network cabling already in place. 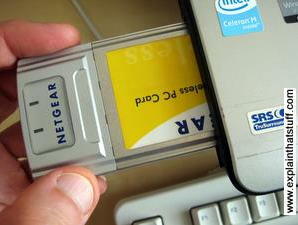 Photo: If your laptop doesn't have a network card, you can simply plug in a PCMCIA adapter like this one. The adapter has a network card built into it. Apart from computers, peripherals, and the connections between them, what else do you need? Each node on a network needs a special circuit known as a network card (or, more formally, a network interface card or NIC) to tell it how to interact with the network. Most new computers have network cards built in as standard. If you have an older computer or laptop, you may have to fit a separate plug-in circuit board (or, in a laptop, add a PCMCIA card) to make your machine talk to a network. Each network card has its own separate numeric identifier, known as a MAC (media access control) code or LAN MAC address. A MAC code is a bit like a phone number: any machine on the network can communicate with another one by sending a message quoting its MAC code. In a similar way, MAC codes can be used to control which machines on a network can access files and other shared resources. For example, I've set up my wireless link to the Internet so that only two MAC codes can ever gain access to it (restricting access to the network cards built into my two computers). That helps to stop other people in nearby buildings (or in the street) hacking into my connection or using it by mistake. The bigger you make a network, the more extra parts you need to add to make it function efficiently. Signals can travel only so far down cables or over wireless links so, if you want to make a big network, you have to add in devices called repeaters—effectively signal boosters. You might also need bridges, switches, and routers—devices that help to link together networks (or the parts of networks, which are known as segments), regulate the traffic between them, and forward traffic from one part of a network to another part. 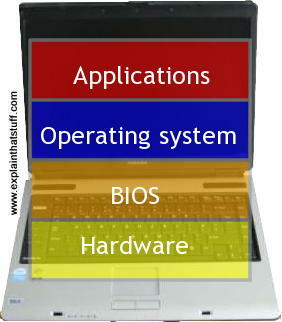 Photo: Computer architecture: We can think of computers in layers, from the hardware and the BIOS at the moment to the operating system and applications at the top. We can think of computer networks in a similar way. Computers are general-purpose machines that mean different things to different people. Some of us just want to do basic tasks like word processing or chatting to friends on Facebook and we couldn't care less how that happens under the covers—or even that we're using a computer to do it (if we're using a smartphone, we probably don't even think what we're doing is "computing"—or that installing a new app is effectively computer programming). At the opposite end of the spectrum, some of us like modifying our computers to run faster, fitting quicker processors or more memory, or whatever it might be; for geeks, poking around inside computers is an end in itself. Somewhere in between these extremes, there are moderately tech-savvy people who use computers to do everyday jobs with a reasonabe understanding of how their machines work. Because computers mean different things to different people, it can help us to understand them by thinking of a stack of layers: hardware at the bottom, the operating system somewhere on top of that, then applications running at the highest level. You can "engage" with a computer at any of these levels without necessarily thinking about any of the other layers. Nevertheless, each layer is made possible by things happening at lower levels, whether you're aware of that or not. Things that happen at the higher levels could be carried out in many different ways at the lower levels; for example, you can use a web browser like Firefox (an application) on many different operating systems, and you can run various operating systems on a particular laptop, even though the hardware doesn't change at all. Computer networks are similar: we all have different ideas about them and care more or less about what they're doing and why. If you work in a small office with your computer hooked up to other people's machines and shared printers, probably all you care about is that you can send emails to your colleagues and print out your stuff; you're not bothered how that actually happens. But if you're charged with setting up the network in the first place, you have to consider things like how it's physically linked together, what sort of cables you're using and how long they can be, what the MAC addresses are, and all kinds of other nitty gritty. Again, just like with computers, we can think about a network in terms of its different layers—and there are two popular ways of doing that. Physical: The basic hardware of the network, including cables and connections, and how devices are hooked up into a certain network topology (ring, bus, or whatever). The physical layer isn't concerned in any way with the data the network carries and, as far as most human users of a network are concerned, is uninteresting and irrelevant. Data link: This covers things like how data is packaged and how errors are detected and corrected. Network: This layer is concerned with how data is addressed and routed from one device to another. Transport: This manages the way in which data is efficiently and reliably moved back and forth across the network, ensuring all the bits of a given message are correctly delivered. Session: This controls how different devices on the network establish temporary "conversations" (sessions) so they can exchange information. Presentation: This effectively translates data produced by user-friendly applications into computer-friendly formats that are sent over the network. For example, it can include things like compression (to reduce the number of bits and bytes that need transmitting), encryption (to keep data secure), or converting data between different character sets (so you can read emoticons ("smileys") or emojis in your emails). Application: The top level of the model and the one closest to the user. This covers things like email programs, which use the network in a way that's meaningful to human users and the things they're trying to achieve. OSI was conceived as a way of making all kinds of different computers and networks talk to one another, which was a major problem back in the 1960s, 1970s, and 1980s, when virtually all computing hardware was proprietary and one manufacturer's equipment seldom worked with anyone else's. Network Access (sometimes called the Network Interface layer): This represents the basic network hardware, and corresponds to the Physical and Data link layers of the OSI model. Your Ethernet or Wi-Fi connection to the Internet is an example. Internet (sometimes called the Network layer): This is how data is sent over the network and it's equivalent to the Network layer in the OSI model. IP (Internet Protocol) packet switching—delivering actual packets of data to your computer from the Internet—works at this level. Transport: This corresponds to the Transport layer in the OSI model. TCP (Transmission Control Protocol) works at this level, administering the delivery of data without actually delivering it. TCP converts transmitted data into packets (and back again when they're received) and ensures those packets are reliably delivered and reassembled in the same order in which they were sent. Application: Equivalent to the Session, Presentation, and Application layers in the OSI model. Well-known Internet protocols such as HTTP (the under-the-covers "conversation" between web browsers and web servers), FTP (a way of downloading data from servers and uploading them in the opposite direction), and SMTP (the way your email program sends mails through a server at your ISP) all work at this level. Artwork: The TCP/IP model is easy to understand. In this example, suppose you're emailing someone over the Internet. Your two devices are, in effect, connected by one long "cable" running between their network cards. That's what the green Network Access layer at the bottom represents. Your email is transmitted as packets (orange squares) using the Internet Protocol (IP), illustrated by the orange Internet layer. 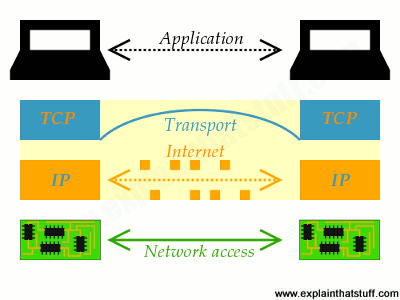 Transmission Control Protocol (TCP) oversees this process in the blue Transport layer; and, in effect, TCP and IP work together. At the top, in the Application layer, you sit at your computer using an email program (an application) that uses all the layers below. While the OSI model is quite an abstract and academic concept, rarely encountered outside books and articles about computer networking, the TCP/IP model is a simpler, easier-to-understand, and more practical proposition: it's the bedrock of the Internet—and the very technology you're using to read these words now. As we saw above, higher levels of the basic computing models are independent of the lower levels: you can run your Firefox browser on different Windows operating systems or Linux, for example. The same applies to networking models. So you can run many applications using Internet packet switching, from the World Wide Web and email to Skype (VoIP) and Internet TV. And you can hook your computer to the net using WiFi or wired broadband or dialup over a telephone line (different forms of network access). In other words, the higher levels of the model are doing the same jobs even though the lower levels are working differently. Like highways or railroad lines that connect towns and cities, computer networks are often very elaborate, well-planned things. In the days when computers were big static boxes that never shifted from data centers and desktops, computer networks also tended to be fairly static things; often they didn't change much from one week, month, or year to the next. The Internet, for example, is based on a set of well-defined connections called the Internet backbone including vast submarine cables that obviously have to stay in place for years. That's computer networking at one extreme. Increasingly, though, we're shifting to mobile devices that need to improvise networks as they move around the world. 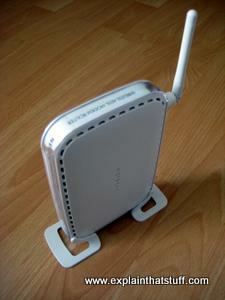 Wi-Fi (wireless Ethernet) is one example of how smartphones, tablets, and other mobile computers can join and leave fixed networks (based around "hotspots," or access points) in a very ad-hoc way. Bluetooth is even more improvized: nearby devices detect one another, connect together (when you give them permission), and form a (generally) short-lived computer network—before going their separate ways. Ad-hoc technologies like these are still based on classic computer networking concepts, but they also involve a range of new problems. How do mobile devices discover one another? How does one device (such as a Wi-Fi router) know when another abruptly joins or leaves the network? How can it maintain the performance of the network when lots of people try to join at the same time? What if all the network devices are using slightly different versions of Wi-Fi or Bluetooth; will they still be able to connect? If communication is entirely wireless, how can it be properly secured? We discuss these sorts of issues in more detail in our main articles about Wi-Fi and Bluetooth. 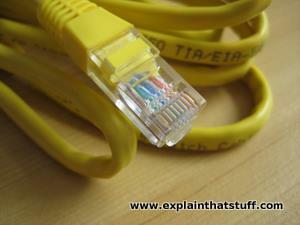 Photo: A typical ethernet networking cable. Not so long ago, computers were all made by different companies, worked in different ways, and couldn't communicate with one another. Often, they didn't even have the same sorts of plugs and sockets on their cases! During the 1980s and 1990s, everything became much more standardized and it's now possible to connect virtually any machine to any other and get them exchanging data without too much effort. That's largely because most networks now use the same system, called Ethernet. It was developed in May 1973 by US computer engineer Dr Robert ("Bob") Metcalfe (1946–), who went on to found 3Com and later became a well-known computer-industry pundit (perhaps, somewhat unfairly, best known for predicting a spectacular collapse of the Internet in 1995 that never actually occurred). As Metcalfe originally designed it, Ethernet was based on three very simple ideas. First, computers would connect through the "ether" (a semi-serious, semi-scientific name for the void of emptiness that separates them) using standard coaxial cable (wires like the ones used in a television antenna connection, made up of concentric metal layers). In Ethernet-speak, the physical connection between the nodes (computers and other devices) on the network is also known as the medium. Things have moved on quite a bit since the early 1970s and the medium is now just as often a wireless radio link (you've probably heard of Wi-Fi, which is the wireless version of Ethernet). Second, all the computers and devices on a network would stay silent except for when they were sending or receiving messages. Finally, when they wanted to communicate, they'd do so by breaking up messages into small packets of data and sending them around the network by a highly efficient method known as packet switching (discussed in much more detail in our article on the Internet). If one machine wants to send a message to another machine on an Ethernet network, it goes through a process a bit like sending a letter. The message has to be packaged in a standard format called a frame (a bit like the envelope that contains a letter). The frame includes a standard header, the address of the device on the network it's intended for (like the address on an envelope), the address of the machine that sent it (like an envelope's return-to or sender's address), an indication of how much data it contains, the data itself, some padding, and some error checking information at the end (used to do a quick check on whether the data has transmitted correctly). Unlike a letter, which goes only to the recipient, the frame goes to every machine and device on the network. Each machine reads the destination address to figure out whether the frame is intended for them. If so, they act on it; if not, they ignore it. Any machine on the network can transmit messages through the ether at any time, but problems will occur if two or more machines try to talk at once (known as a collision). If that happens, the machines all fall silent for a random period of time before trying again. Eventually, one will find the ether is clear and get its message out first, followed by the other, so all messages will get through eventually. Typical Ethernet equipment can handle thousands of frames per second. In tech-speak, this method of using the network is called carrier sense multiple access with collision detection (CSMA/CD): that's a fancy way of saying that the nodes do their best to transmit when the ether is clear ("carrier sense"), they can all theoretically send or receive at any time ("multiple access"), and they have a way of sorting out the problem if two happen to transmit at exactly the same time ("collision detection"). An interview with Bob Metcalfe: Manek Dubash offers this fascinating interview with the Ethernet pioneer to mark 40 years of his world-changing invention. Oral history of Bob Metcalfe: A much longer (almost three-hour) oral history interview with Len Shustek of The Computer History Museum. How do computer networks detect errors? Suppose you order a book by mail order and it arrives, a few days later, with the packaging ripped and the cover slightly creased or torn. That's a kind of error of transmission. Fortunately, since a book is analog information, a bit of damage to the cover doesn't stop you appreciating the story the book tells or the information it contains. But what if you're downloading an ebook (electronic book) and there's a blip in transmission so some of the data goes astray. Maybe you won't be able to open the book file at all, rendering the whole thing useless. Or what if a bank is sending an electronic payment to someone and the data it transmits across its network is corrupted so the account number or the amount to be paid gets scrambled? What if a military control center sends a signal to a nuclear missile installation and a blip on the network alters the data it contains so, instead of "power down," the rocket is told to "launch immediately"? The point is a simple one: when we send data over computer networks, we need to be absolutely certain that the information received is identical to the information transmitted. But how we can do this when vast amounts of data are being sent around the world all the time? Artwork: Checking the integrity of a large download with an MD5 code: If you've ever downloaded a linux distribution (anything from a few hundred megabytes to several gigabytes of data), you've probably done this—or you certainly should have done! On the original download page, you'll be given an MD5 checksum code matching the file you want to download. Once your download is complete, you simply run the file through an MD5 calculator program (here I'm using winMd5sum) to calculate the MD5 code from the data you've downloaded. If the two MD5 codes match, you can be reasonably confident your file downloaded without any mistakes. Computers and computer networks have all kinds of ingenious ways of checking the information they send. One simple method is to send everything twice and compare the two sets of data that are received; if they don't match, you can ask for all the data to be resent. That's laborious and inefficient—doubling the time it takes to transmit information—and there are far better methods of keeping data straight. One of the simplest is called parity checking (or parity bit checking). Suppose you're sending strings of binary digits (bits, made up of zeros and ones) over a network. Every time you send seven bits, you add up the number of ones you've sent. If you've sent an odd number of ones (1, 3, 5, or 7 of them), you then send an extra 1 to confirm this; if you've sent an even number of ones (0, 2, 4, or 6), you send a zero instead. The receiver can do the same sums with the data it sees, check the parity bit, and so detect if a mistake has been made. Unfortunately, with simple parity checking, it's not possible to say where an error has been made or to correct it on the spot, but the receiver can at least spot a batch of incorrect data and ask for it to be sent again. 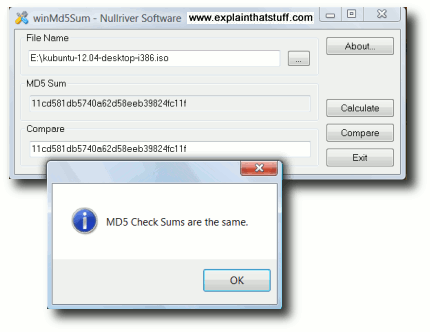 More sophisticated ways of detecting errors are usually variants of checksums where, every so often, you add together the numbers you've previously sent and then transmit the total (the sum) as a check. The receiver does the same calculation and compares it with the checksum. But what if multiple errors occur (say, the checksum is transmitted incorrectly as well as some of the original data), so they cancel one another out and go undetected? There are much more sophisticated versions of checksums where, instead of simply adding the data you've transmitted, you process it in more complex ways that make it far harder for errors to slip through. When you download large files, for example, you'll sometimes be given what's called an MD5 hash code to check, which is a long number (often in hexadecimal or base 16 format, made up of the numbers 0–9 and the letters A–F) computed from the original file by a complex mathematical algorithm. A typical MD5 hash code would be 7b7c56c74008da7d97bd49669c8a045d or ef6a998ac98a440b6e58bed8e7a412db. Once you've downloaded your file, you simply run it against a hash-checking program to generate a code the same way. Comparing the codes, you can see if the file downloaded correctly and, if not, try again. Some forms of error checking not only allow you to detect errors but make it possible to correct them without retransmitting all the data. Among the best known are Hamming codes, invented in 1950 by US mathematician Richard Hamming to improve the accuracy and reliability of all kinds of data transmissions. They work by using more error detection bits so that the position of an error in transmitted data can be figured out and not just the simple fact that an error has occurred. Computer Networking: A Top-Down Approach by James F. Kurose and Keith W. Ross. Pearson Education, 2017. A comprehensive guide to networking written in a clear, engaging way with plenty of meaningful examples. Networking All-in-One For Dummies by Doug Lowe. For Dummies, 2016. Covers topics such as how to build and secure a network, wireless and mobile devices, and everyday administration. Computer Networks by Andrew S. Tanenbaum and David J. Wetherall. Pearson, 2013. One of the best-known and most popular textbooks on networking, now in its fifth edition. Computer Networks by Clive Gifford. Wayland, 2015. An illustrated 32-page introduction for ages 8–10, focusing mainly on the Internet and the Web. Understanding Computer Networks by Matthew Anniss. Raintree/Capstone, 2015. A 48-page introduction for ages 9–12. Again, the focus is mainly on the Internet. How Internet Giants Upended the Networking-Hardware Business by Cade Metz. Wired, February 19, 2015. Facebook, Google, and Amazon have radically reinvented the hardware that connects the Internet together. OSI: The Internet That Wasn't by Andrew L. Russell. IEEE Spectrum, July 30, 2013. How eminently practical TCP/IP eclipsed the more conceptual, committee-driven OSI approach to networking. Building Networks on the Fly by Robert Pascoe. IEEE Spectrum, March 1, 2001. How networking technologies like Bluetooth create improvised networks.